With Satellite 6.1 and the Docker Plugin, this is a snap. The Docker Plugin is installed out of the box and only takes minutes to configure. The Docker plugin is quite flexible and allows a user to consume upstream content from the Red Hat Registry, Docker Hub, and internal Registries. It even allows administrators to pull images from Content View. Content Views give developers and administrators a way to quickly move Docker images through a controlled Dev/QA/Prod development lifecyle and can even help facilitate a Continuous Integration/Continuous Deployment lifecycle. First we are going to add a simple external Registry in Satellite. This is a simple pass through. When container hosts are provisioned, they will pull their data directly from the external registry server but everything will be controlled and audited from within Satellite. 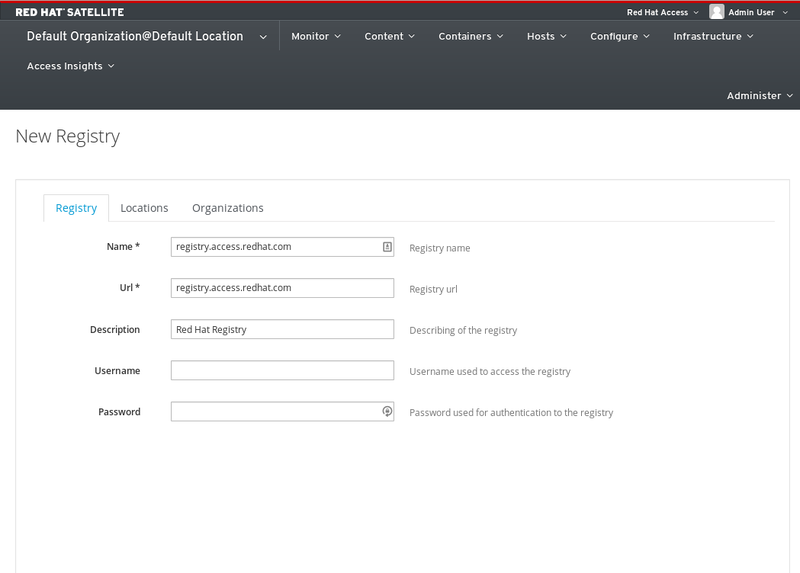 For this example, we are going to connect to the official Red Hat Registry, but Satellite can be configured to pull content from any upstream registry server, internal or external. From the web interface, users can even search the external registry for content. Next, let's add all of the necessary data structures within Satellite to leverage Content Views. All of this can be done with just a few commands, making it easy to setup a new Satellite Server. 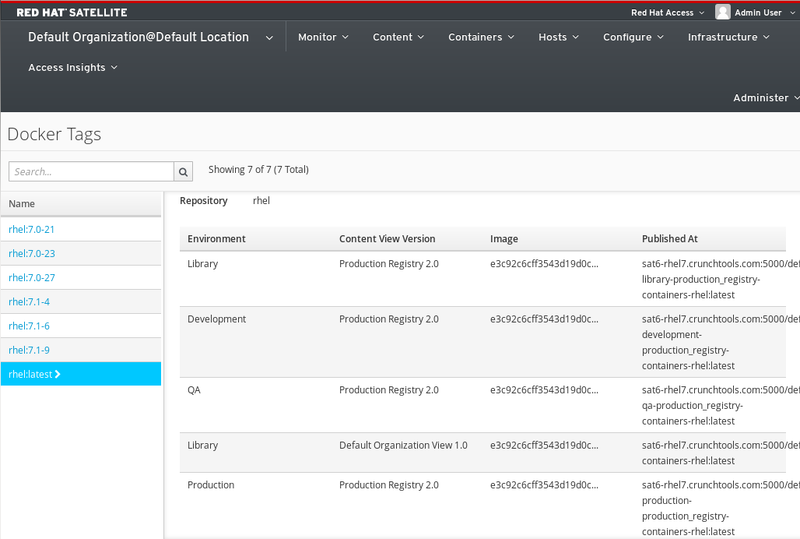 hammer repository create --name='rhel' --organization='Default Organization' --product='Containers' --content-type='docker' --url='https://registry.access.redhat.com' --docker-upstream-name='rhel' --publish-via-http="true"
hammer content-view create --organization='Default Organization' --name "Production Registry" --description "Production Registry"
hammer content-view add-repository --organization "Default Organization" --name "Production Registry" --repository "rhel" --product "Containers"
hammer content-view publish --organization='Default Organization' --name "Production Registry"
Now we are going to add a RHEL 7 or RHEL 7 Atomic host to be managed by the Satellite Server. First we need to configure the Docker Daemon to allow remote access to the API. This is not secure, so don't do it in production without restricting access to the Satellite server with firewall rules. Now modify the OPTIONS Line to look like this. Notice the debug configuration. This is not mandatory but will definitely help if you run into trouble. You are now done with all of the configuration. Let's get on to deploying containers! In this section we are going to demonstrate how to provision a container from DockerHub, an External Registry Server and from a Content View. It is important to understand that when provisioning from DockerHub or an external Registry, the container will be deployed with the content directly from the upstream registry server. There is no temporal control (aka snapshot) of the content. With a Content View, you can still pull content from an upstream registry server, but you have the advantage of finer grained control over which images can be deployed where. You can have newer versions of the same repository in Development and QA, with fully tested versions in Production. With Satellite you get all of this in a single server. At first, you might say to yourself, well I can do that with Docker Tags right? While life cycle management could be done with good policy and Docker Tags, Content Views provide the technical controls and adhere to the principals of infrastructure as code. Administrators control which versions of a repository are available instead of relying on easily outdated documentation. Users can't pull newer or older versions by mistake. In fact the administrator has complete control over which sets of data container hosts receive based solely on the URL they connect to. As will be seen later in the Docker Tags section, there are separate unique URLS for Development, QA and Production. This is very convenient when coordinating between developer's laptops and server running in production. In the following example, the Satellite server is really acting like three different registry servers (Development/QA/Production). Now it's time to show the real power of Satellite Server. From the web interface, at step two, you simply select the Content View you want to deploy from. The output looks like the following. Notice the piece of information we are after is the "Published At:" section. We are going to use the default_organization-production-production_registry-containers-rhel portion to provision the container from within Satellite, but developers can use the full URL when pulling images down to their laptops! And voila, we can provision any tag we want from the Production Version of the Content View. This is very powerful in allowing developers to pull the same controlled content that is in production. One final really cool feature is the Docker Tags page. From this page administrators and developers can list all of the docker tags and associated URLs. Notice the Published At column. Administrators can share these URLs so that users can pull certain versions of content directly to their laptops for development and testing. We demonstrated how easy it is to deploy an on premise, enterprise registry server with Red Hat Satellite 6.1 and the Docker plugin. Workflows are quick and easy to setup with a powerful command line interface (CLI). The choice of the CLI or web interface makes it easy to provision and manage containers long term. The foundations provided in this article will arm administrators, release engineers, and developers with workflows they can rely on for years to come. Future articles will go deeper into how to build a production ready workflow between developers and systems administrators. It is known that you do not run Puppet inside of containers, but rather manage dockerfiles w/ Puppet. I get a 404 when trying to add the docker compute resource to satellite. Any ideas? HI, What about guide to set up a local Registry Server instead of adding an External Registry Server ¿? Is it possible, from the client, to push back a saved .tar file to the docker registry in Satellite? What is the command? "docker push...."